Introducing Amaco’s NEW line of Cone 6 Celadon glazes! These 18 transparent gloss glazes beautifully highlight surface texture and are 100% mixable – that’s a quality you definitely won’t find in most glaze series! Use the glazes as a multi-hued palette to create your own special customized celadon colors, or adjust the transparency of your glaze by adding C-11 Mixing Clear. 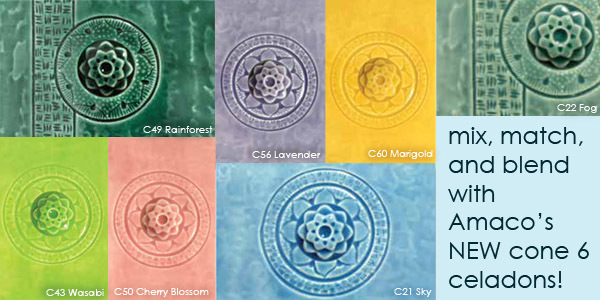 You can also add C-11 Mixing Clear to soften the colors of any glaze in the series. Celadon glazes highlight surface texture and bring out the color of the clay underneath. All glazes are available in pints – mix and match to bring a little color into your studio today!